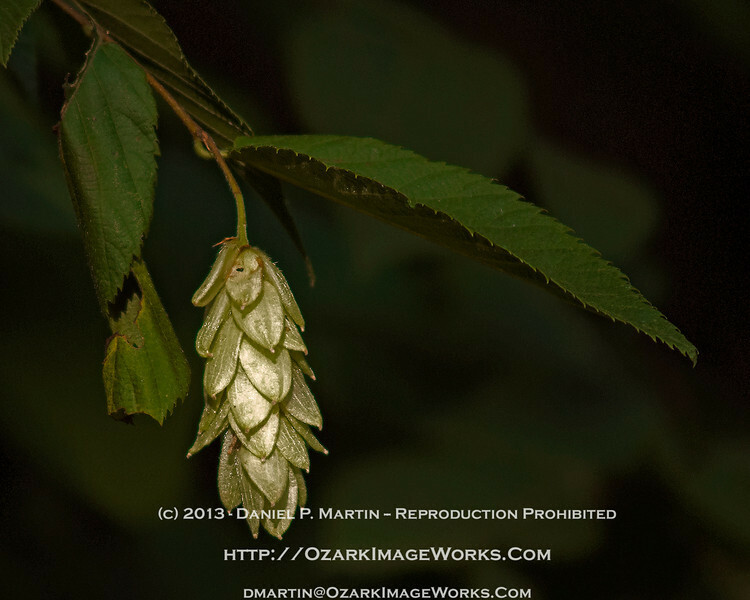 Hop Hornbeam (Ostrya Virginiana) blossom - late June, 2013. Also known as "Ironwood" because this native understory hardwood tree produces very dense, resilient wood. Modern uses of the wood range from the mundane (tool handles), to the exotic (high-quality longbows). Historically, Ironwood was used in the Ozarks for any application where strength, durability and rot-resistance was important -- everything from fence posts to sled runners to aircraft propellers. Blossoms appear in late spring or early summer in the form of surprisingly delicate catkins. Later in the season, the color shifts becoming light tan to brown. In winter, the seeds are a food source for several native bird species.